Because of the availability of so many features, assess your needs before heading to the store to purchase a new washer or dryer. You don’t want to waste money on extra features you won’t use or come home with an appliance that doesn’t have everything you need. Kenmore, established over 100 years ago, offers both traditional top-loading models and efficient front-loading washing machines. Kenmore also has some of the largest capacity washers available on the market. Whirlpool washing machines take full advantage of the latest technology and offer features such as 6th Sense Live technology and the Smart Stats tool, which lets you see how much energy goes into your laundry appliances. Maytag has been helping homeowners with their domestic chores for over 100 years. Their washers and dryers are available as either front-loading or top-loading and are Energy Star qualified to save you money while you do laundry. LG washing machines come in different colors and are created with a modern design. The washing machines also feature two unique technologies; LG True Steam and a 6-motion washing cycle that mimics hand-washing movements. 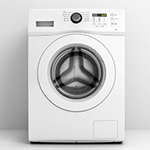 Samsung offers large capacity washers in both top and front loading designs. The company's Energy Star models are environment and budget friendly, and the Super Speed feature gets your laundry done up to 40 percent faster. GE offers all types of washing machines, including stackable models and portable washing machines. They also focus on customer care with easy access to replacement parts and technicians who can service your new washer. Headquartered in Ripon, Wisconsin, Speed Queen is an American manufacturer of home appliances. Founded in 1908, it offers a range of dryers, top and front load washers, and stackable units across the United States. Sears distributes numerous brands of washers and dryers, including but not limited to Kenmore, Whirlpool, LG, Maytag, and Samsung. Models are high-efficiency or traditional, to accommodate the laundry needs of different families. Frigidaire washers and dryers are popular for their quality construction and extras, like precision moisture sensors and pedestal drawers for storage. Models with Quick Wash mode are perfect for when you're short on time. Front load and compact washers and dryers, starting at $949. Washers include SmartBoost® for effective stain removal. Dryers include Predictive Dry™ technology, which predicts drying time within the first 90 seconds. 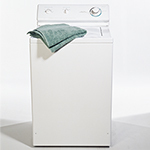 Take our two minute quiz to find the right Washers and Dryers for you. One of the most basic features consumers look for in a washer is its ability to properly wash clothing, including effective removal of stains, odors and other debris. At the same time, it's important to have a washer that reduces wear and tear on fabrics to keep clothing in good condition over time. Steam washing: Some newer washing machines offer steam cleaning settings that can help penetrate tough stains while being gentle on fabrics. Quick wash: A quick wash feature is great washer feature for when you want to save time on your wash cycles. This feature often saves energy as well. Gentle wash cycles: While removing dirt, stains and debris from clothing is important, a gentle wash cycle option allows for less pressure and stress on fabric to keep clothes looking great longer. Certain washers also feature a wool cycle setting, allowing users to wash wool without damaging or shrinking the fabric. Automatic dispensing: Washers with automatic dispensers can be filled up for many cycles and then automatically dispense an exact amount of detergent for a more efficient use of detergent. It can also ensure you have the right amount of detergent to get out stains and leave clothing clean afterward. While all dryers usually have no problem drying clothes, there are some instances where a dryer can over-dry clothing. Consumers want a dryer that can leave their clothes in excellent condition after a drying cycle, keep in enough moisture to ensure the clothes aren't damaged, and have different drying settings for extra speed or handling different fabrics. Moisture sensor: A dryer with a moisture feature is one of the top features to look for. This sensor is designed to ensure clothes are dried just right, and then tells the machine to shutdown. Fabric types: Dryers often include different settings for different fabric types, including regular settings for cotton clothing and permanent press for delicates. The right settings can help get clothing dry without damaging fabrics. Speed dry: A speed dry setting allows a user to quickly dry a small amount of clothing with minimal energy output, typically completing drying in a 15-minute cycle. Extended tumble: Extended tumble keeps the clothing tumbling after the drying cycle, typically with no extra heat. This is designed to get wrinkles out of clothing. Energy efficiency is a major feature that consumers now look for when purchasing a washing machine or dryer. Water efficiency is also important for washers as well. For washing machines, there are new federal standards that require all washing machines made after March 6, 2015 to use less energy and water. Energy Star for washing machines: If you purchase an Energy Star washing machine after March 6, 2015, you can expect the washing machine to use 25 percent less energy and 40 percent less water than a standard washer. New efficient washers tend to use much less water and require less detergent that traditional washing machines. Energy Star for dryers: Energy Star dryers use 20 percent less energy than standard dryers. Energy Star recommends consumers purchase dryers with a moisture sensor, and consider a gas-powered dryer instead of an electric one for better energy savings. Spin speed: Most washing machines have a spin speed ranging between 1,000 and 1,600 revolutions per minute (RPM). Models with higher spin speeds tend to get clothing drier faster, meaning less energy is used later for the drying process later. Low heat Setting: Dryers that offer a low heat setting usually provide better energy savings. This setting dries clothing over a long period of time at lower heat. Consumers should ensure they have the right capacity for their washer and dryer. Capacity impacts how much clothing can fit in a cycle, the washing and drying ability of a machine and even has an impact on energy consumption and the environment. Capacity increasing: For both washers and dryers, the trend seems to be an increase in capacity. For washers, expect to see capacities ranging from 12 to 28 pounds depending on whether the washing machine is a top-loading or front-loading washer. For dryers, you can expect to see sizes of large, super and even super-plus on some models. Increased capacity allows consumers to fit more clothing in during a cycle and reduce the frequency they need to wash and dry clothing. Width considerations: Standard washers and dryers are around 27 inches wide, but for larger models you can expect three extra inches to each machine. That means larger models paired together might require an extra six inches. Average capacity needs: Most families can meet their needs with washers that can fit 15 to 24 pounds of laundry. However, larger families and consumers who do laundry more often may need larger capacities. For dryers, larger capacity machines can also dry clothing more quickly, helping save on energy costs. In some cases, washing machines and dryers can be quite loud, an important factor if bedrooms or other important rooms are close to the laundry room. However, some newer models are extremely quiet, depending on the brand and type of machine you purchase. Washing machine noise: Top-loading washing machines tend to be noisier than front-loading washing machines. Front-loading washing machines usually have a tighter seal, and due to their design, are less likely to be unbalanced during the washing cycle. Mechanical transmission: Top-loading washing machines tend to use a mechanical transmission, which usually produces more noise than a front-loading machine. Dryer noise: Newer dryers tend to produce less noise than traditional dryers. Consumers often also look for an option to turn off end-of-cycle sounds to reduce noise disturbances. Consumers should look for washing machines and dryers that offer long-term quality and endurance. There are a number of factors that can impact maintenance, durability and ease of use. Washing machine differences: Top-loading washing machines tend to require less maintenance than front-loading washing machines. Front-loading washing machines may need to have the door seal replaced from time to time, and some older models may also be more prone to leakage than top-loading machines. Top-loading machines may also require a freshening cycle to clean the door seal. Dryer differences: In terms of repair and maintenance, dryers with a top-mounted lint collector and a lint sensor are excellent features that reduce breakdowns, decrease fire hazards and improve efficiency. Warranties: Some companies are so sure of their design, they offer 20-year warranties on their washers. Normally, consumers can expect one to five year warranties that will cover mechanical breakdowns. Kenmore is a household appliance brand that has been marketed and sold by Sears since 1927, underlining Kenmore's long time commitment to delivering quality to consumers. Kenmore washers are produced by top brands like GE, Whirlpool and LG. Whirlpool is generally considered the largest home appliance maker in the world. The company employs over a 100,000 employees, with many of them located right in the United States. The company also has a strong commitment to environmental and social causes. The same dedication to quality that GE puts into building products like jet engine turbines and wind towers goes into their washing machines. GE is an American symbol of industry that was ranked the 14th most profitable large firm in the United States and has even had employees that have won Nobel Prizes. Frigidaire has been innovating since the company invented the original self-contained refrigerator in 1918. Since then, the company has grown explosively, making a wide variety of kitchen and laundry appliances that suit nearly every household need. Samsung's name is associated with quality, and produces everything from electronics to home appliances. Based in South Korea, the company generated a massive 305 billion dollars in 2014, employs nearly 500,000 people and sells its products to nearly every country in the world. LG is a South Korean based company employing 82,000 people on a global level. LG is known for its innovative washer and dryer designs and commitment to offering consumers energy-saving options. Haier is a relative newcomer to the home appliance industry, but it has made a huge impact. It now employs over 80,000 people and generates over 30 billion dollars a year in revenue. LG offers both electric and gas dryer models, appealing to different energy needs. 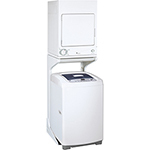 The company also offers combination washer and dryer models that are stackable for those who need optimal performance machines in a compact space. Midea, the world’s third largest appliance maker, was founded in 1968. They focus on space saving appliances. Their washer/dryer combo units don’t need an outside vent and take up less space than stackable washers and dryers. Whirlpool washing machines are available in both high-efficiency and traditional models, and also in stacked units with attached dryers. Whirlpool has a variety of models, including the Whirlpool Calypso Washer and Dryer. Haier specializes in compact washers and dryers that save space while still offering the functionality of full-size appliances. Offerings include combination washer and dryers, wall-mountable models and portable appliances. While KitchenAid no longer manufacturers washers and dryers, used models can still be found online or at local used appliance stores. KitchenAid's laundry line had a reputation for durable models that stood the test of time. Panda manufactures small, portable washers and dryers. Their products are designed for apartments, dorm rooms, RVs and other small spaces. Most units weigh less than 30 pounds, and have a 5- to 12-pound capacity.